There is a strong expectation that the private sector will provide a large share of the 100 billion USD per year in climate finance that world leaders have pledged to mobilize by 2020 under the UN Framework Convention on Climate Change (UNFCCC). Globally in 2014, two-thirds of the 361 billion USD in financial flows relevant for mitigation in 2014 came from the private sector. Yet as little as 8% of that was invested outside the country where the finance originated – and only a small fraction reached the Least Developed Countries (LDCs). It is thus important to ask whether it is realistic for LDCs to expect significant flows of private climate finance. 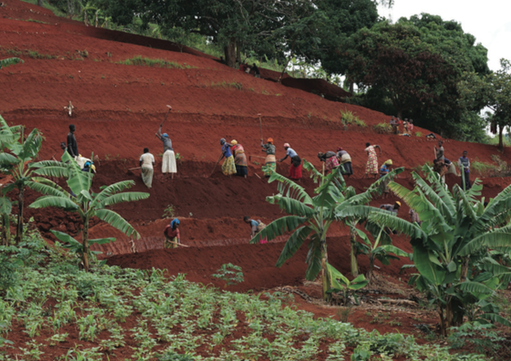 This policy brief examines that question for Rwanda, focusing mainly on adaptation. It draws on a literature review and on interviews with 25 key stakeholders from ministries, agencies, international organizations, the private sector and civil society. Rwanda has prioritized private-sector investment in development and climate-related activities. It has laid out a clear vision in key policy and planning documents, but it has yet to create a strong enabling environment for private-sector investment in adaptation. Little private climate finance for adaptation has been mobilized to date. Foreign direct investment plays a tiny role in Rwanda’s economy, and it is unlikely to make a major impact on adaptation in the country. Increasing FDI may be important to Rwanda from an economic perspective, but to increase private-sector investment in adaptation, the government and development partners should focus on empowering the Rwandan business community – much of it small and medium enterprises. This policy brief* examines the prospects for mobilizing private climate finance in Rwanda, focusing mainly on adaptation, and highlights measures that could stimulate investment. *Download form the right-hand column. A brief account of the method and the key messages and policy recommendations are provided below. Please refer to the full text for much more detail, including a short description of the FONERWA-funded project on Rooftop Rainwater Harvesting, which brings together a public agency and a financial institution. In order to understand how Rwanda could scale up private ad- aptation finance, we apply an analytical framework that divides the process into three phases: the establishment of an enabling environment, and the mobilization and delivery of finance. The enabling environment is the foundation on which the two other phases are built. It is the policies, institutions and incen- tives set up by the government to mobilize private finance. It may also involve public investments (e.g. in infrastructure) to lay a foundation for private investment, or in specific projects, seed funding, risk mitigation (e.g. loan guarantees), or co- financing. Such efforts are not confined to finance for climate-related investments, but could nonetheless deliver private-sec- tor investments aligned with the country’s adaptation priorities. Yet even if government incentives are in place, they may prove ineffectual, or they may mobilize private finance, but not in a priority sector or location. The resulting investments may also have limited adaptation benefits or cause maladaptation. For example, a business might be incentivized to build a dam, with clear adaptation benefits, such as flood prevention or water storage for irrigation. But it might also increase vulnerability – for instance, by reducing the amount of water available downstream, or to local farmers not connected to the new irrigation system. Rwanda has prioritized private-sector investment in de- velopment and climate-related activities. It has laid out a clear vision in key policy and planning documents, but it has yet to create a strong enabling environment for private-sector investment in adaptation. Little private climate finance for adaptation has been mobilized to date. Greater efforts and tailored incen- tives are needed to raise private-sector awareness of both climate risks and business opportunities related to adaptation. Development partners can play a key supporting role here. Foreign direct investment plays a tiny role in Rwanda’s economy, and it is unlikely to make a major impact on adaptation in the country. Increasing FDI may be im- portant to Rwanda from an economic perspective, but to increase private-sector investment in adaptation, the government and development partners should focus on empowering the Rwandan business community – much of it small and medium enterprises. While there are strong ambitions for private-sector climate finance, the policies in place in Rwanda have not translated into an enabling environment for private investments in adaptation activities. There are further policy needs before the government’s vision can be turned into enabling mechanisms. Corporate social responsibility initiatives are a good first step to mobilize additional private finance and scale up private investments. However, there is a need for a systematic approach to move beyond that step and prove the business case for investing in adaptation. There is a need for more awareness-raising, capacity- building and information-sharing between the public and private sectors. International donors and the Rwandan government should make adaptation part of a broader development agenda, using scarce funds for larger initiatives as a way to entice the private sector to contribute to adapta- tion as a co-benefit of development projects. Readiness support is a good way for international partners to help advance domestic efforts, but more is needed. It is important to pool international resources and include different stakeholders and actors, to focus on capacity-building, technology transfer and finance. The Green Climate Fund is a key actor in this regard.